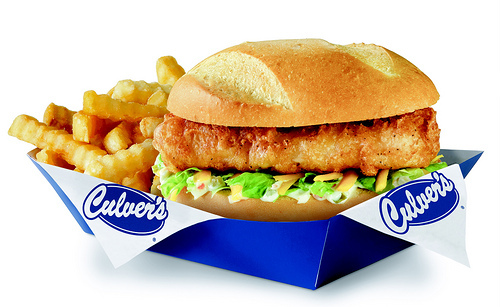 This post is filed under Bread, Culvers, Fast Food, Fish, Lettuce, Tartar Sauce, Walleye. wtf is “Culver’s”? never heard of it. please stick to national items, or else what’s the point? You obviously don’t live in the Midwest. The are everywhere in Wisconsin. can you at least clue us in when you’re talking about something regional? say, “non-flyover people can skip this post”? Now isn’t this difficult, finding something on the internet that isn’t especially for you. In other words, grow up – the world doesn’t exist to cater to you. I went to Culver’s today for lunch and had this, it was really good although mine was so hot I burned my tongue a bit. There was some residual hot oil on it that caused most of the damage, but once it cooled down I whole-heartedly agree with this rating. I wouldn’t complain if he did a review of In-n-out burger or White Castle, even though those aren’t in my region, so I see no reason why others should complain about him doing reviews of Culver’s. Culver’s is one of those places where no matter what you order they seem surprised, and the teenager at the counter has to turn around and stare at the menu board. I imagine a seasonal item would really throw them. It’s too nerve-racking for me to order there. And that thing looks for all the world like a deep-fried geoduck clam with the shell transmogrified into a bun. Quite a generous “Looks” rating. Compared with some of your other rating, I would have assumed this got a 1 or 0. Where are the divets in the bun? Where is the cheese and sauce? Lettuce? I think i see one little remnant of it under that monstrous piece of fish. I think you’re top pic is the North Atlantic Cod Filet, which could account for the different size and shape of the fish. Check out the pics on their site. I’ve always had good service at Culvers’; must just be depending on how well your local Culver’s trains their employees. Education, my foul-fingered friend. Education. The only deduction I’m taking due to a slight bitter aftertaste I got after two or three bites; I’m not sure if that’s unique to walleye or if it was related to residual cooking oil, but it wasn’t enough to stop me from immediately wanting to go buy another one. I noticed the bitter aftertaste with my first ever Culver’s walleye sandwich yesterday. I bought one again today, but got mayo instead of tartar sauce, and no bitterness at all, just a wonderful tasting sandwich! Culver’s adds sweet relish, dill relish, and green olives to their tartar, I much prefered the mayo.